Solar water fountains allow you to enjoy the magic of flowing water without an electrical connection. From tiny tabletop models to grand installations for formal gardens, the range of options for solar fountains approaches that of typical electric-powered fountains. Solar water fountains harvest the sun's energy and convert it to an electrical current to power a pump. They are one of many ways to use green technologies in the landscape. A solar-powered fountain can be installed wherever there is sufficient sun to power it - at least six hours per day of direct sunlight is ideal. For shady locations, choose a model with a detached panel that can be mounted nearby in a sunny location. Using the sun's energy to power a fountain is one of many ways to conserve the Earth's limited resources in planning the home landscape, but the advantages of solar go beyond being environmentally friendly. That being said, there are a few drawbacks to consider. Installing a fountain typically involves the added expense of paying an electrician to run power to the part of the yard where the new water feature is to be located, but a solar-powered fountain eliminates this added expense and complexity. Operating expenses are reduced to zero, as well, unlike electric fountains which can really drive up utility bills. Solar-powered fountains generally cost more than electric fountains that produce the same amount of water flow - though this cost will eventually be recouped through savings on the electric bill. Also, the amount of water they put out varies based on how sunny it is, so on cloudy days the flow can slow to a trickle. At night they shut off completely unless the fountain comes with a battery to store the sun's energy for when it's not out. There is a solar water fountain to fit any budget or garden style. Peruse the following options for a model that fits your needs. 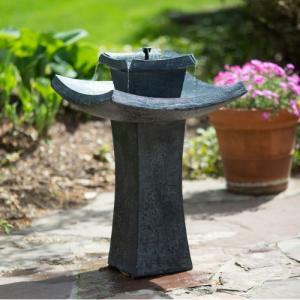 Look for a solar water fountain that matches the style of your home and garden. Lowe's carries a cascading fountain with four ceramic bowls for under $200 that would be a great fit for an outdoor landscape with modernist décor. Kinetic Fountains offers a number of options for more traditional, formal landscapes, such as the Argus Peacock fountain that doubles as a bird bath. 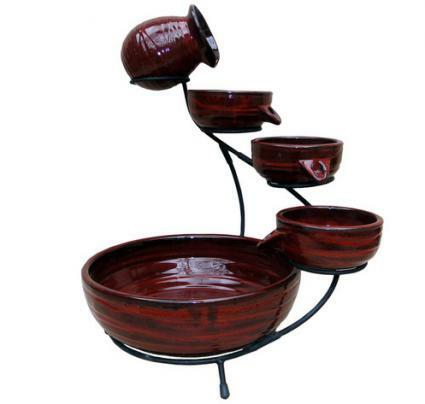 Hayneedle sells a modern Zen solar fountain that would fit in an Asian inspired garden. It costs around $200 and will work for up to six hours at a time when the charge is full. It also has a back-up battery. Solar fountains can take a number of different forms depending on your needs. If you have an existing pond and you want to install a solar fountain in the middle of it, try a simple floating fountain like those found at Ali Express for around $20 or less. Amazon, for example, sells a Venetian wall fountain that comes with a 16-foot cord for the solar panel. 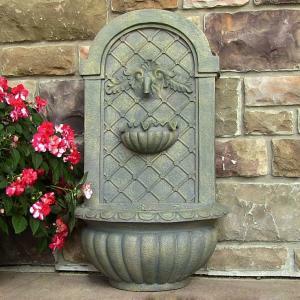 It runs about $200 and is perfect if you don't have a lot of room for a fountain that sits on the ground. If you want to configure your own fountain, invest in a kit that includes a panel, cord, pump and other hardware that allows you to create a solar fountain out of whatever materials you would like. Amazon offers a good kit for about $150. There is nothing more soothing than the sound of flowing water. The beauty of a solar powered water fountain is that you can put them wherever you please, without going through the trouble of installing an electrical connection. Plus you will rest that much easier knowing that you're relaxing without wasting energy.